Mature man using pc tablet. Middle-aged man with computer tablet on blurred ackground. People, technology and lifestyle. Mature man using pc tablet. Middle-aged man with computer tablet on chroma key background. People, technology and lifestyle. Mature man talking via internet. Middle-aged happy man talking via digital tablet with colleagues, blurred background. People, technology, lifestyle. Mature man web surfing on pc tablet. 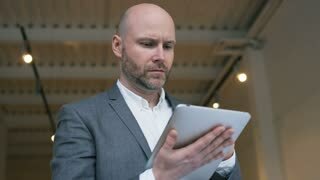 Caucasian middle-aged manager working on digital tablet, blurred background. Positive middle-aged man working on pc tablet. Mature office worker using digital tablet on window background.